I never believed in love at first sight until it happened to me. Last month, I fell in love hard. 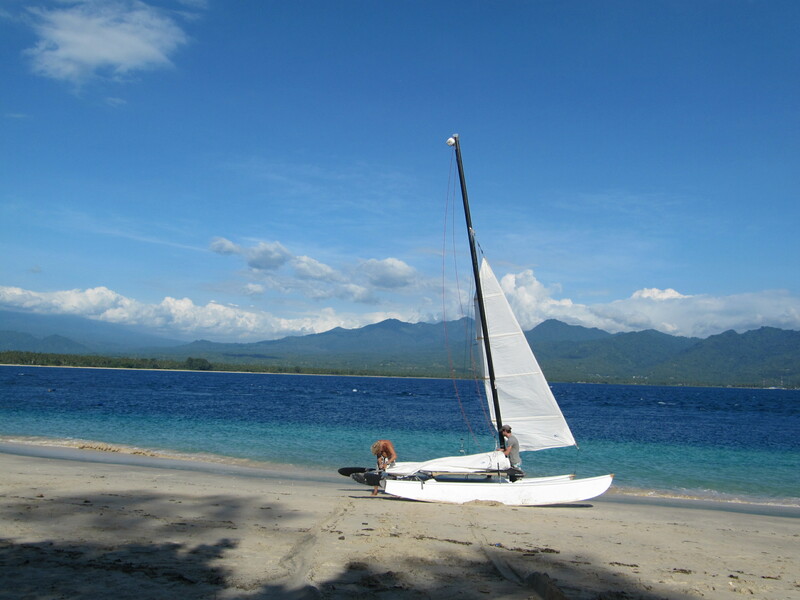 With a place called Gili Air. The island of Gili Air off the coast of Lombok in Indonesia is one of the most beautiful places we’ve visited so far, and easily one of my favorites. I am almost hesitant to tell too many people about it, I’m scared that it might become too crowded and commercialized and spoil the magic of the place. Actually… you should probably stop reading this right now! And definitely don’t go there, it’s terrible! Dreadful!! Well anyways, the three islands are Gili Trawangan, known as the party island, Gili Meno, known for its laid-back seclusion, and Gili Air — which we picked because it was said to be a good mix of the other two. We booked a fast boat from Bali, and after about an 1.5 hour ride arrived at what has now become my standard for paradise on earth. Pulling up to the island, I was immediately in love with the vibe — beautiful little beaches, cute bungalows, boats bobbing off the coast, restaurants on the beach, and the bluest water. And the longer we stayed, the harder I fell for the place. Grab a horse-drawn carriage at the harbor to get around the island. Adding to the quaint atmosphere, there are no cars or motorbikes on the island. The only ways to get around are by bicycle, on foot, or by horse-drawn carriage. 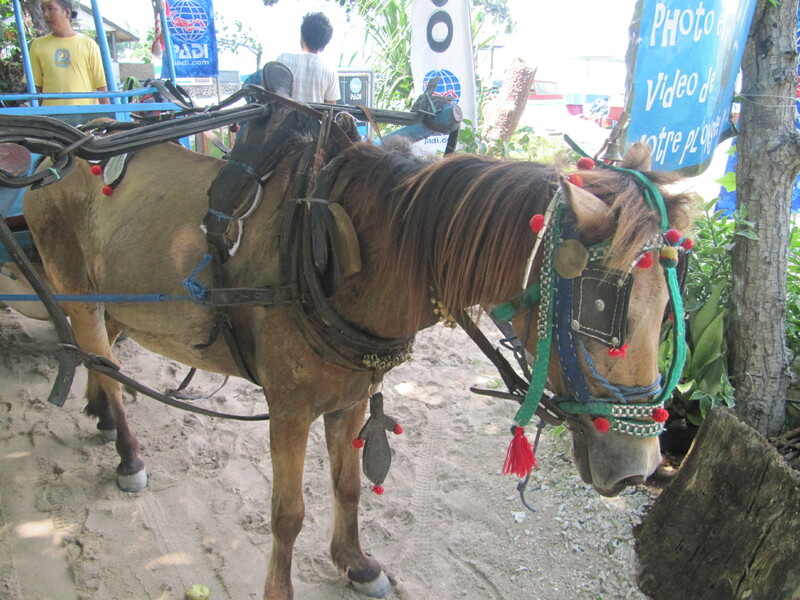 When you get off the boat and collect your bags, there is a line of horse carriages to meet you and take you to your hotel for a few dollars fare. It’s pretty small, you can walk around the whole island in about an hour. Though small and very relaxed, there is no lack of things to do here — snorkeling trips, diving, glass-bottom boat rides, yoga, kite surfing, sailing, or just lounging on the beach and swinging in a hammock. Sails up! Ahoy! And other nautical sayings. Here’s a little peek at some snorkeling and sailing we did around the island. We swam alongside a few sea turtles in the crystal clear water — they are such beautiful, majestic creatures, they look so relaxed as they swim around. Great memories. 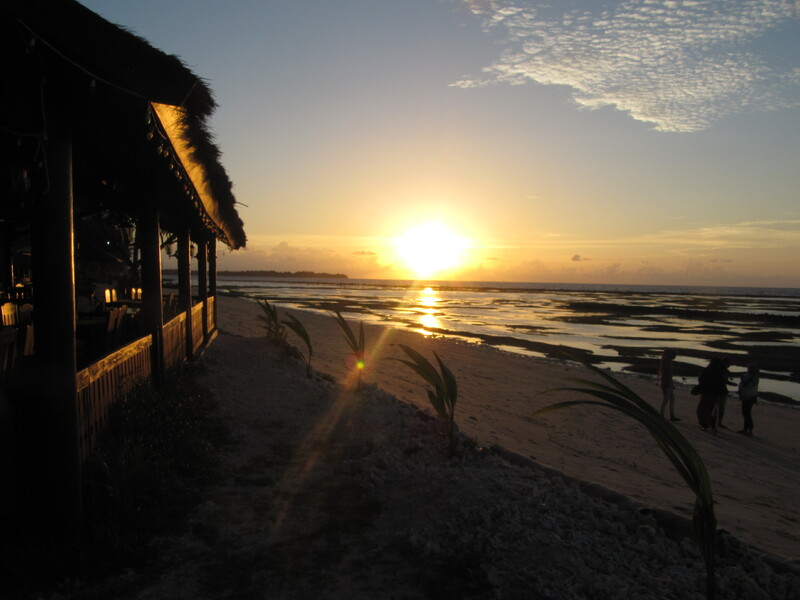 Every evening we’d head to the west side of the island just before sunset and grab some happy hour drinks from a bar with seats on the beach. And these were some of the most amazing, clear, colorful sunsets I’ve ever seen. For dinner, we would stroll among the restaurants, which displayed the day’s catch on ice out front. We’d pick out our meal from the piles of fresh fish, lobster, prawns, crabs and they throw it on a nearby open wood grill to cook it to perfection. Some of the best fish I’ve had. Almost sunset! Time to get to happy hour! But what makes the experience here really unique is the people. I’m learning more and more that the atmosphere of a place and the feeling you take away from it can be really heavily influenced by the locals. 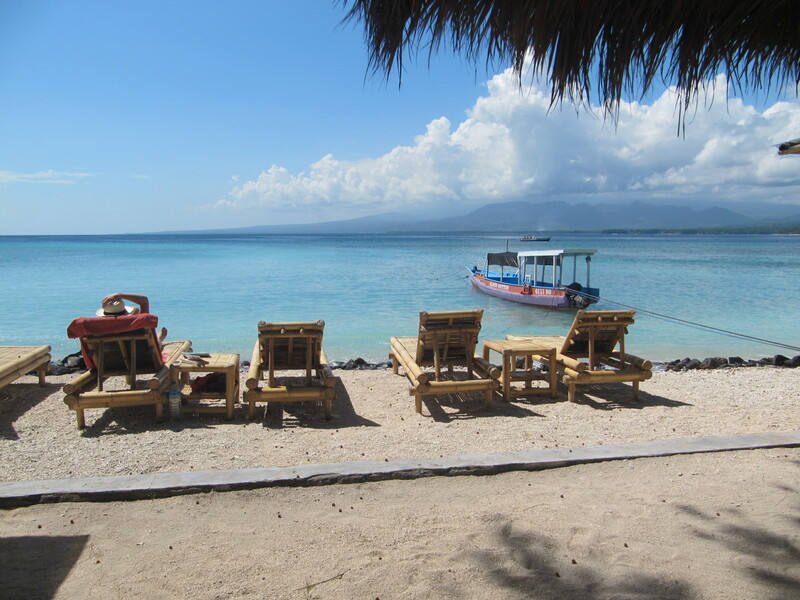 The people on Gili Air made you feel at home instantly and were beyond friendly and helpful. They would ask your name and remember it, and say hi to you days later on a different part of the island. It is so welcoming and refreshing, especially traveling in other places where locals are not friendly to travelers and just try to rip you off with overpriced fares and scams. The island is a very safe, small community — the bike rental stores do not even lock up the bikes at night. Each night as we walked around, the locals would tell us which bar the party would be at that night. At the nightly beach party, there were bonfires, fireworks, Chinese lanterns floating into the sky, and a DJ right on the beach, with people dancing in the sand until morning. The parties are for the locals as much as they are for the tourists, and everyone you’ve met on the island is there hanging out together. This is one of the few places I’ve been where the locals party with travelers and welcome them openly to their social events. It’s all about the vibe — and I can see why the people here are so friendly and happy. They are living in one of the most laid-back, serene, and beautiful places around. This place is truly magical. There is just happiness in the air. It’s the only place so far that I really felt sad to leave. If you ever are in the area of have the opportunity, go here. Errr, umm, I mean don’t go — and don’t tell. Anyone. Shhhhhhhhh. Love the underwater music video! Your descriptions are wonderful; wow … didn’t think a place like this still exists! My kind of place; probably similar to what Hawaii was before it was “discovered”. I was going to tell you both to have a great time, but it seems you’re one step ahead of me. Hi Steve! Thanks for reaching out. I just read Alex’s blog — it’s great! Fellow travelers and bloggers are not competitors 🙂 we are kindred spirits. I will keep up with it. Cheers! Wow – this looks AMAZING! I have heard such great things about the diving on the Gilis, I can’t wait to make a trip there and try it myself. And info or tips about the cost of visiting there?? Hi Rika! We didn’t go diving there, but I heard it was amazing. Lots of sea turtles around and manta rays. If you are going in the busy season, it would probably be wise to book accommodation ahead of time. We booked the first 2 nights but then just walked around the island asking if places had rooms open and easily found a spot – we wanted a bungalow that faced right out onto the beach 🙂 it was very affordable — we paid about $30 a night. Food is cheap too and beers about $2. Have an amazing time! care of such info much. I was looking for this particular info for a very long time.